Maybe it will happen when you look at the existing cornucopia of color kits and question whether you want to lug their extra 20 pounds to every single client meeting. Perhaps it will sink in when you finally acknowledge that there is limited marketplace demand for rooms in neon green, screeching yellow, or gunmetal teal. But whatever awakens you to the thought, as an Architectural Color Consultant, there will come a time when you consider the benefits of customizing your Consultation Color Kit. But doesn’t “customizing” automatically mean “limiting” your options? Not necessarily. It only means that you don’t have to carry each and every possible option with you like a pack mule heading into the Himalayas for a year-long quest. But how do you decide what to include on most journeys to the client and what to usually leave in the studio? First, there are several technical issues to consider, including the quality of different paint companies’ product lines, the specific needs of the clients you meet with most often, your own professional leanings, and more. All paints are not created equal, after all, so you need to decide which brands work best for you. That decision may be driven, in part, by the types of clients you serve most often. And your own leanings? Well, as with any profession, the more you learn, the more you will discover what you feel works best for your clients. After the above core criteria are satisfied, you can move on to the fun stuff – having to choose which colors to keep in your core repertoire. I thought it would surely be easy for someone as experienced as me to sort out the necessary from the disposable…until it became painfully clear that I really enjoy most colors in one way or another. Sometimes it felt as if I were splitting up a family, so having to decide which ones to leave waiting back in the studio cabinet caused some exasperation. In the end, I succeeded in customizing my own Consultation Color Kit. I am now proud to say that I no longer carry around bundles and books of unnecessary colors. 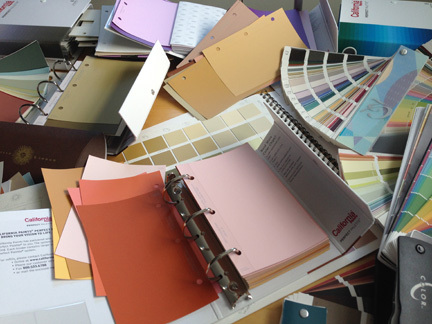 It makes my life as an Architectural Color Consultant easier, and is actually easier on my clients, too. And in this business, achieving beauty efficiently matters. Besides, if the color I have with me is almost but not quite perfect for the effect I’m creating for a client, I also know that I still have exactly the right color, tone, and hue waiting eagerly in my studio to be put to work. The only benefit I can see from carrying around a million colors is the workout! Seriously though, it only serves to confuse the client. They just aren’t necessary. Great info Gloria. Thank you for commenting Teresa. Actually, my shoulders thank you too! Ok love this – I’m inspired. So over the lugging of collateral and you’re right – I’ve only ever had one client who wanted that luminous yellow green. Even cutting down the size of the samples has to reduce the weight by 50% (right ??). Will keep you posted on how the new colour customised ME goes. Hi Karen, Yes keep us posted! I would like to add one more thing about bringing limited color options to a consultation. I’ve often seen a look of overwhelm on my client’s faces when I show up with all those kits. They have hired us to narrow down and corral their choices, not bowl them over at the get go. It’s so true! It can be overwhelming for a client to look at your ‘fleet’ of kits. Simplifying is so much easier for both you and your client.